A very striking vertical reclining dial 85 x 115 cm created from hand painted tiles, each individually fired in a kiln and assembled at Tenango de Doria by David Canyedo. In addition to hour lines, the dial includes declination lines for the solstices and equinox. The dial includes constellation maps of both the northern and southern hemispheres, a celestial sphere, and rose of winds (compass). The artistry also includes NAHUI OLLIN (the fifth sun which is the era we are living in according to the Aztecs). The dial has an equation of time that allows conversion from local solar time to standard time. The dial was designed to arouse interest of high school students in astronomy. This horizontal dial is an engraved flagstone approximately 40 inches in diameter designed by John Carmichael. The monofilar gnomon is a stranded brass cable that extends upward to a height of 15 inches and is held taught by a rock counterweight. The engraved stone shows time marks to 5 minutes, corrected for longitude. Time and direction of sunrise and sunset for the equinoxes and solstices are also given. This is a 10 x 10 foot south vertical wall dial with hour lines painted on the wall that are corrected for longitude. A unique feature of this dial is the time scale can be rotated forward or back slightly to compensate for the Equation of Time. However, because only the hours are marked, precise minute reading is difficult. Welded steel was used to make the time marker ring and gnomon. A triangular based horizontal dial with a triangular moat. The outer triangular sides are approximately 12 feet (4 meters). The dial and moat are built of concrete, with an aluminum or sheet metal gnomon about 150 cm. On the dial are metal pyramids to indicate hours. The sundial was donated by the Tecnologico de Monterrey University. A large equatorial dial with steel gnomon. The massive dial is set simply on a set of tiered platforms. The inner tiers are rotated from the outer to align to the cardinal points. Elsie Raye Rigney Carr and Dr. Jesse Lawrence Carr gave the dial to the university in 1975 in memory of Raye Hines Rigney, Class of 1911. A 4x4 foot marble vertical dial declining 25° east of south with a copper gnomon, located above the center entrance of the Grand Lodge Hall and overlooking the formal garden of the Masonic Village of Elizabethtown. The dial face includes hour lines with half hour and ten minute marks and Roman numerals. An inscription, "ANNO DOMINI MCMXII" is located above the gnomon. The dial declines 25° east of south. A large, ornate equatorial dial of brass sits outside the physics department building. The dial is approximately 8 feet across. Two pillars with brass balls support the dial plate. Two more pillars with ball support the gnomon wire. To add a flourish, the north most pillar and ball have a spread eagle holding the gnomon wire in its mouth. Unfortunately this beautiful dial is tarnished by age, with the analemmas for each hour barely visible on the dial plate. The gnomon wire, broken sometime in the past, is jury-rigged and tied together in the middle, resulting in a unkempt look to such a fine dial. A dark, round stone base, perhaps made of slate, approximately 8 foot in diameter supports the dial and pillars. The stone sits upon a 10 x 10 foot concrete pad. 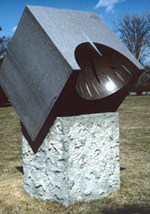 The Wilderness Center Sundial is large horizontal dial with a 6-foot steel gnomon approximately 27 inches thick. The base is done in slate with copper numbers.